When you're making your college dorm checklist of college supplies to buy and take to college, it can be easy to forget some dorm essentials. In fact, you may not have even thought you needed them! It's understandable- you may be thinking more about your Twin XL dorm bedding or college posters for your dorm room decor. Do you want really awesome dorm room decor? Of course you do! For really awesome dorm room decor, there is a dorm essential that you probably didn't think could add to your dorm room decor- our 10 Pack of Course Scouring Pads! To start college out right, you need to have these handy dorm necessity scouring pads in your college trunk and bags that you're taking to college. Your college dorm room may have been cleaned before you moved in, but it may have been awhile since it was cleaned. You will want to be preventative and clean from the start by wiping down your college provided dorm items- your dorm desk, closet, dresser, and especially your dorm mini-fridge and microwave if your college supplied them. These dorm items may or may not need much cleaning, but you will have peace of mind if you start cleaning those dorm items before you even unpack. 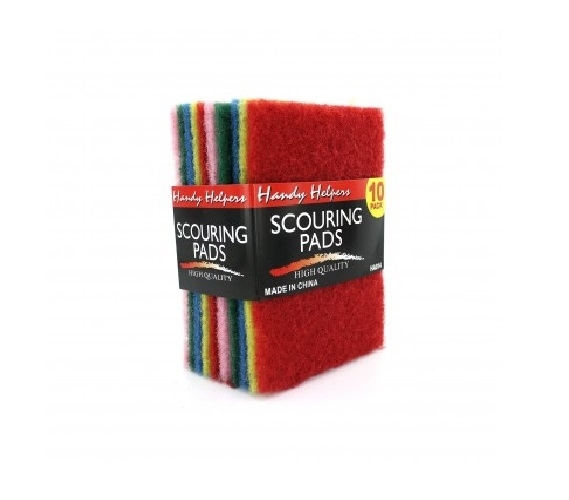 Of course, our 10 Pack of Course Scouring Pads isn't just good for move in day- these are are also a dorm essential on move out day. After all, you don't want to pay any damage fines at the end of the school year. To really start college strong, you will want to have a back up supply of these dorm essential scouring pads in your college trunk or dorm closet for any spills or general cleaning you will want to do throughout the year. After all, having a clean, organized dorm room will do so much for your dorm room decor!